Hardwood floors are beautiful and can upgrade the look and feel of an entire room. Hardwood flooring is not only visually appealing, but it can also increase the value of your home and attract additional buyers. Whether you are a buyer, seller or a happy homeowner with remodel on the mind, we hope the guide below serves as a valuable resource tool! Hardwood flooring traditionally came in thick planks of solid timber, but today many companies also offer planks made with a thinner top layer of hardwood, called engineered flooring. 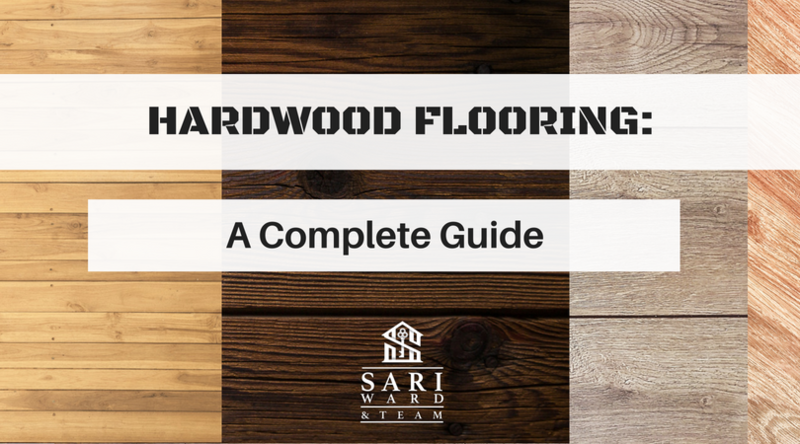 The top layer of hardwood is bonded to other layers and is designed to prevent the floor from shifting during expansion and contraction cycles. Engineered flooring provides an installation advantage for basements and apartments with concrete subfloors. Engineered flooring can be glued directly to concrete, or over a soundproofing mat and is suitable for installation over radiant heat. Solid wood is generally installed over one or two layers of plywood, which can raise the height of a floor and interfere with existing doors or marginally, reduce ceiling height. Hardwood planks can be purchased with a raw face that is prefinished or finished on-site by a professional after installation. A prefinished plank is delivered with the stain and topcoat already applied. Prefinished wood takes less time to install than wood that is finished after installation because there is no need to apply color or sealant. However, unfinished flooring is smoother than prefinished flooring because unfinished flooring is typically sanded after it is nailed down and then finished as a single continuous plane. Onsite finishing allows designers and homeowners to customize the stain and sheen of the wood and have more control of the overall look. While there is a full spectrum of finishing products, most finishes fall into the categories of oil or polyurethane. An oil finish has a look and feel that is very soft, matte, and natural, but is more prone to stains and damage when compared to polyurethane. While oil finishes tend to scratch more easily, the scratches are also less noticeable, and easy to touch-up. A soft oil finish is easier maintenance, but requires maintenance more frequently. If polyurethane flooring is damaged, it can require a single board replacement or a buff and recoat of an entire section of floor. Oak is the king of hardwood flooring in North America, as it has an appealing natural grain and is widely available and affordable across the region. White oak is a popular type of oak, since it does not possess the pinkish tones of red oak. Walnut is another a popular type of wood flooring that is slightly softer than oak. Walnut’s deep color makes it ideal for rooms where a richer, warmer finish is desired. Other popular types of wood include: hickory, cherry, maple, and ash. Logs are cut in three different ways—plain-sawn, rift-sawn, and quarter-sawn—each yielding three different grain patterns. Plain-sawn produces traditional wood grain, with undulating patterns known as cathedrals. Rift-sawn boards, feature a long, linear, consistent grain, and do not have cathedrals. Quarter-sawn boards look similar to rift, but have additional irregular figuring with 3D-like rays that strike out across the plank. A four- to six-inch plank is typically the standard width size for flooring. However, the width of the plank should depend on the size of the room and the method of application. Typically larger, more expansive rooms use wider planks of wood, which provide a high-class look and feel. While wider-width planks can be more visually attractive, it is important to note the planks get more expensive as the width increases. Do you want even more tips from Sari & Team? Read our blog about bathroom renovation by clicking here! If you want to learn more about hardwood flooring and installation, check out the full Architectural Digest article here.